For nearly half a century, the only fights about school lunch took place in cafeterias across the country with kids wielding fish sticks and chocolate pudding as weapons. Otherwise, in the fifty years since the Child Nutrition Act was signed into law, there was bipartisan consensus that as a nation, we should make every effort to ensure children from food insecure households and communities had enough to eat. Today, that consensus is unraveling. Recently, the U.S. House of Representatives committee responsible for school breakfast and lunch and other nutrition programs voted to make it substantially harder to feed children in our communities. Sadly, our Congressman Mike Bishop, joined them, and the bill appears likely to pass. Congressman Bishop voted yes on the so-called Improving Child Nutrition and Education Act of 2016 (H.R. 5003); a dangerous piece of legislation both because of the immediate cuts it makes to the critical programs that help to feed children, and for the clear message it sends about Congress’ future plans to undo our social safety net. Of immediate concern is a provision that reduces the number of schools allowed to provide meals at absolutely no charge to students. Currently, schools can provide free meals to all students if 40 percent of the student body is automatically eligible. The new bill would raise that threshold to 60 percent. This means that 7,000 schools nationwide, which have been providing free meals to 3.4 million children, will no longer be eligible to serve all students. Michigan has more than 500 schools in counties across the state that are eligible for, or already participating in, this program. For example, 40 percent of the students in Ingham County, which ranks 39th in the state in overall child well-being, qualify for free or reduced price lunches. In many of these schools the students who don’t qualify for free meals live just above the poverty line and their families are still struggling. Allowing the school to feed all students not only helps reach those children who fall through the cracks, but also reduces the resources and administrative time it takes these schools to feed their students. Furthermore, the bill includes a provision replacing critical nutrition assistance programs with “block grants” in three states as a pilot program. Abandoning tried and tested social programs, Congress would instead give the cash directly to state governments, with little or no oversight on how it is used. This would jeopardize standards, cause dramatic and unnecessary changes to how schools operate, and, in the long term, could mean significant funding redirected away from the child nutrition programs altogether. The bill’s proponents clearly want to take this dangerous experiment nation-wide – a risk we cannot afford to take with our children. During a meeting with NETWORK earlier this spring, Congressman Bishop called himself a “numbers guy.” When it comes to child nutrition, the data doesn’t lie. The most recent Michigan Kids Count report found that nearly 1 in 4 kids are living in poverty, a 23 percent increase from 2006 to 2014. Perhaps Congressman Bishop is unaware of the chaos and scrambling for resources that we know will follow the types of changes he voted for in the child nutrition bill. Or maybe he has simply accepted the misinformation his colleagues in Congress sold him and misguidedly thinks this is the way to help our children. No matter what, Congressman Bishop has the opportunity and the responsibility to lead. He must get the facts, and step up and fight back against this proposal to take food – quite literally – out of the mouths of babes. Cherie Mollison is a member of the East Lansing Catholics Network, a local affiliate of NETWORK, the national Catholic social justice lobby. 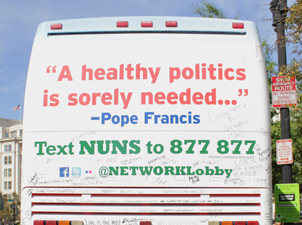 NETWORK organizes the annual “Nuns on the Bus” tour, now in its fifth year. This entry was posted in Food Security, Front Page on June 16, 2016 by networklobby.